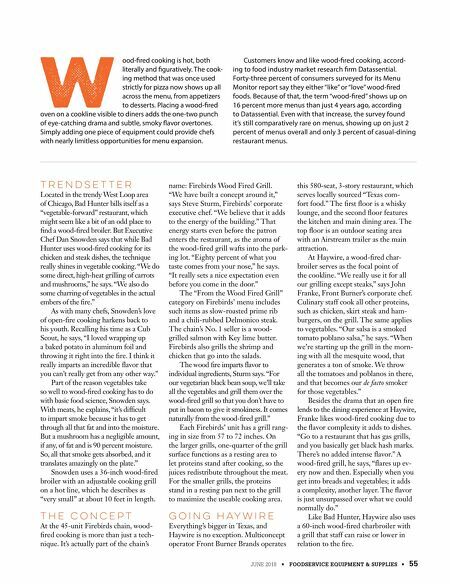 JUNE 2018 • FOODSERVICE EQUIPMENT & SUPPLIES • 55 W ood-fired cooking is hot, both literally and figuratively. The cook- ing method that was once used strictly for pizza now shows up all across the menu, from appetizers to desserts. Placing a wood-fired oven on a cookline visible to diners adds the one-two punch of eye-catching drama and subtle, smoky flavor overtones. Simply adding one piece of equipment could provide chefs with nearly limitless opportunities for menu expansion. 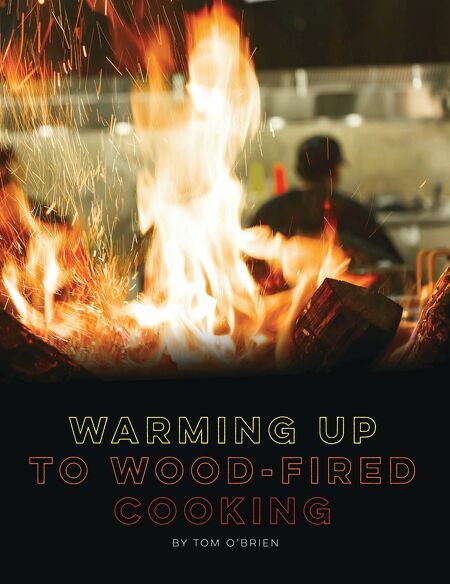 Customers know and like wood-fired cooking, accord- ing to food industry market research firm Datassential. Forty-three percent of consumers surveyed for its Menu Monitor report say they either "like" or "love" wood-fired foods. Because of that, the term "wood-fired" shows up on 16 percent more menus than just 4 years ago, according to Datassential. Even with that increase, the survey found it's still comparatively rare on menus, showing up on just 2 percent of menus overall and only 3 percent of casual-dining restaurant menus. T R E N D S E T T E R Located in the trendy West Loop area of Chicago, Bad Hunter bills itself as a "vegetable-forward" restaurant, which might seem like a bit of an odd place to find a wood-fired broiler. But Executive Chef Dan Snowden says that while Bad Hunter uses wood-fired cooking for its chicken and steak dishes, the technique really shines in vegetable cooking. "We do some direct, high-heat grilling of carrots and mushrooms," he says. "We also do some charring of vegetables in the actual embers of the fire." As with many chefs, Snowden's love of open-fire cooking harkens back to his youth. Recalling his time as a Cub Scout, he says, "I loved wrapping up a baked potato in aluminum foil and throwing it right into the fire. I think it really imparts an incredible flavor that you can't really get from any other way." Part of the reason vegetables take so well to wood-fired cooking has to do with basic food science, Snowden says. With meats, he explains, "it's difficult to impart smoke because it has to get through all that fat and into the moisture. But a mushroom has a negligible amount, if any, of fat and is 90 percent moisture. So, all that smoke gets absorbed, and it translates amazingly on the plate." Snowden uses a 36-inch wood-fired broiler with an adjustable cooking grill on a hot line, which he describes as "very small" at about 10 feet in length. T H E C O N C E P T At the 45-unit Firebirds chain, wood- fired cooking is more than just a tech- nique. It's actually part of the chain's name: Firebirds Wood Fired Grill. "We have built a concept around it," says Steve Sturm, Firebirds' corporate executive chef. "We believe that it adds to the energy of the building." That energy starts even before the patron enters the restaurant, as the aroma of the wood-fired grill wafts into the park- ing lot. "Eighty percent of what you taste comes from your nose," he says. "It really sets a nice expectation even before you come in the door." The "From the Wood Fired Grill" category on Firebirds' menu includes such items as slow-roasted prime rib and a chili-rubbed Delmonico steak. The chain's No. 1 seller is a wood- grilled salmon with Key lime butter. Firebirds also grills the shrimp and chicken that go into the salads. The wood fire imparts flavor to individual ingredients, Sturm says. "For our vegetarian black bean soup, we'll take all the vegetables and grill them over the wood-fired grill so that you don't have to put in bacon to give it smokiness. It comes naturally from the wood-fired grill." Each Firebirds' unit has a grill rang- ing in size from 57 to 72 inches. On the larger grills, one-quarter of the grill surface functions as a resting area to let proteins stand after cooking, so the juices redistribute throughout the meat. For the smaller grills, the proteins stand in a resting pan next to the grill to maximize the useable cooking area. G O I N G H A Y W I R E Everything's bigger in Texas, and Haywire is no exception. Multiconcept operator Front Burner Brands operates this 580-seat, 3-story restaurant, which serves locally sourced "Texas com- fort food." The first floor is a whisky lounge, and the second floor features the kitchen and main dining area. The top floor is an outdoor seating area with an Airstream trailer as the main attraction. At Haywire, a wood-fired char- broiler serves as the focal point of the cookline. "We really use it for all our grilling except steaks," says John Franke, Front Burner's corporate chef. Culinary staff cook all other proteins, such as chicken, skirt steak and ham- burgers, on the grill. The same applies to vegetables. "Our salsa is a smoked tomato poblano salsa," he says. "When we're starting up the grill in the morn- ing with all the mesquite wood, that generates a ton of smoke. We throw all the tomatoes and poblanos in there, and that becomes our de facto smoker for those vegetables." Besides the drama that an open fire lends to the dining experience at Haywire, Franke likes wood-fired cooking due to the flavor complexity it adds to dishes. "Go to a restaurant that has gas grills, and you basically get black hash marks. There's no added intense flavor." A wood-fired grill, he says, "flares up ev- ery now and then. Especially when you get into breads and vegetables; it adds a complexity, another layer. The flavor is just unsurpassed over what we could normally do." Like Bad Hunter, Haywire also uses a 60-inch wood-fired charbroiler with a grill that staff can raise or lower in relation to the fire.